Grab a few drinks and enjoy your night. The best part about these dive bars in NY are that they are not that expensive. Head on over to one of these bars with some friends or by yourself and enjoy the night in good company of the other bar attendees. The jukebox blasts punk music, garage music, broken-blues and more. The Double Down Saloon is not your typical bar. One of New York's best dive bars, the Double Down Saloon is covered in graffiti murals and live bands never play here. Shoot some pool, enjoy the music, or take part in the most common activity at this bar: drinking. A backyard patio is open to those who smoke. Escape from the stresses of everyday and come to the Double Down Saloon. You will feel as though you have entered an entirely new world. 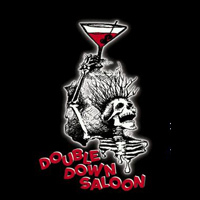 Check out the Double Down Saloon's drink specials by going to their website now! This NY dive bar is unlike any other you will visit. Make sure you don't miss out! At Port 41 you will find cheap drinks, free hot dogs served with every drink, and free popcorn, not to mention the bartenders that wear bikinis all day every day. Port 41 is one of the best New York dive bars to go to. At this bar you will see people of all ages and personalities. There is fun for everyone at Port 41 and they guarantee you will have more fun here than any other dive bar in the area. If you get hungry all you have to do is go across the street to the 99 cent pizza shop. Port 41 has security at all times so there's no need to be scared to walk into this bar. Tip the bartenders well and you will have the best night ever. Go to Port 41's website to check out the drink specials. Best drink specials in NY! At the Continental dive bar in New York you will find cheap drinks and great people. The Continental prides themselves on having the best dive bar jukebox in the world and best looking guests. Happy hour is from 4 p.m. - 8 p.m. every day and more drink specials are offered from 8 p.m. - 4 a.m. Need another reason to go to the Continental dive bar? You can get 5 shots of your choice for just $10 all day and night. Where else can you find drink specials like these? 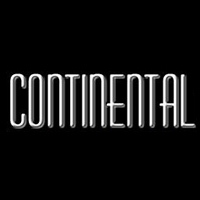 You will have a great time at the Continental dive bar whether you go during the day or at night. A dress code is strictly enforced so make sure you go to their website to check out all of their rules. Taking inspiration from both the classic Irish pubs and New York City Bars, the 11th Street Bar is a New York dive bar that everyone should visit. Live events are constantly hosted here including poetry readings, live music, pub quizzes, and live sports. No matter what you are interested in, the 11th Street Bar will have entertainment for you. 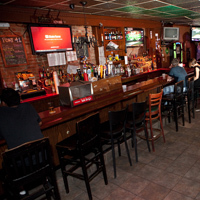 With the best beers available, the 11th Street Bar is a great place to go to if you are looking for a relaxing hangout. Grab some friends and a few beers and spend your night at this NY dive bar. Check out their website to see the calendar of events. Reservations are available so call today! The last and oldest original dive bar in New York, 169 Bar is one of the best dive bars in New York to visit. 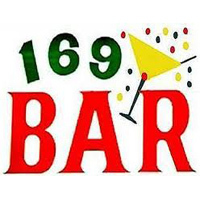 Inside 169 Bar you will find an oyster bar and a raw bar and your ears will be filled with jazz and funk music. Enjoy the full food menu that is served every day and grab some drinks. Making this bar unique to all others, 169 Bar allows you to text in your order from your table. There is never a cover at this bar! Reservations are accepted and encouraged for large parties. There is also a back room available for private parties. 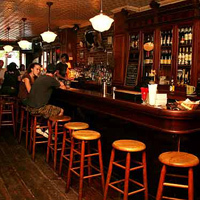 Giving entertainment to New York for over 100 years, 169 Bar is a must-visit!